Easy Lentils and Sausage Stew is an Italian Fall Soup made with Italian Sausages, Lentils and Fresh Veggies. Healthy, Filling and Delicious. The Perfect Dinner Stew or Soup. Ahhh comfort food, probably one of the best food dishes to eat. 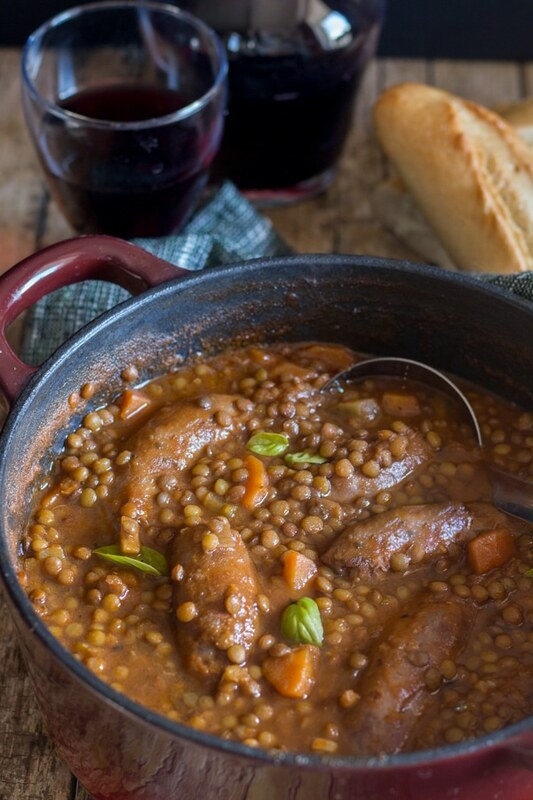 I have to say this Lentils and Sausage soup is one of my favourite Comfort Dishes. Over the years I have become a great appreciator of lentils. Actually I have come to love and cook all kinds of Beans, from Green Beans to Borlotti and everything in between. Whether I make an all Veggie Dish or add meat or as in this case Italian Sausages, beans are a must have staple in my home. In Italy I have probably tasted more than my share of beans, from fresh to dried there are so many to choose from. I now appreciate the huge selection available whether Italian or North American. Tuscany, the northern region of Italy, is famous for producing beans. Cannellini, also known as white kidney beans, are, perhaps, its most popular bean. Borlotti beans are from the region of Veneto in the north. Borlotti beans are also considered to be the healthiest because of their high iron content. Chickpeas or Garbanzo beans are cultivated in the south of Italy and are considered the most consumed bean in the world. Fava beans are also cultivated in the warmer regions of Italy from the south. Italians like to eat these cooked or raw. The May 1 holiday in Italy is celebrated with pecorino cheese and raw fava beans. If you haven’t tried them, I will say they are all worth trying at least once. 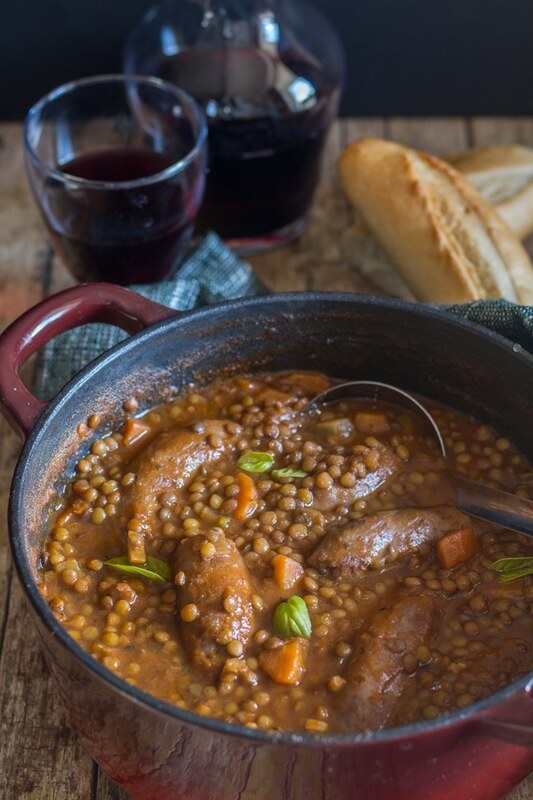 Lentils and Sausage Stew is a traditional and hearty comfort dish, that makes one of the most popular Italian winter will meals. This dish is easy to make but does need a some time for preparation, This stew is delicious served with a simple salad or a slice or two of Italian crusty bread and a glass of red wine. I added basil in this recipe but you could also use sage or even thyme if you prefer. 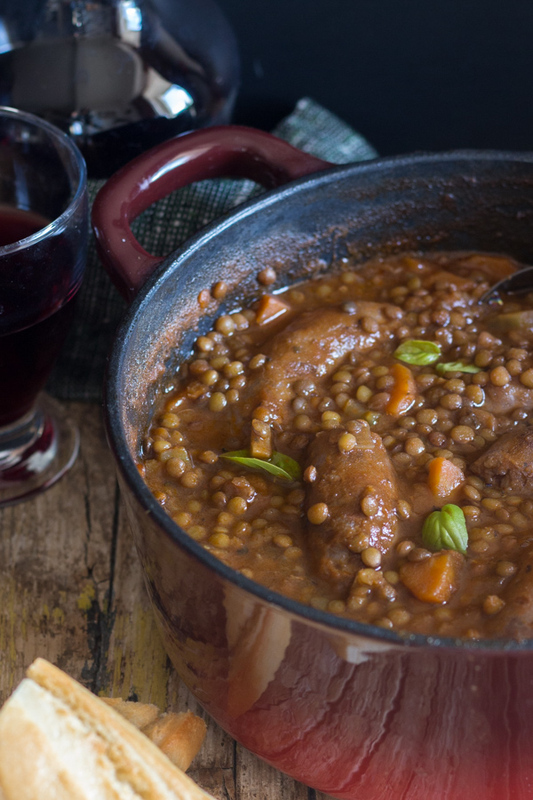 This Lentils and Sausage Soup is served just after midnight on New Years in Italy. It is considered a good luck dish which is supposed to bring you lots of money in the New Year! Do you need to soak Lentils? The good thing about dried lentils is you don’t have to soak them over night. You can cook them right away if you are out of time, although it is best for digestion and to speed up the cooking time if you let them soak for at least 30 minutes or even one hour. Sometimes I will cut the sausages into pieces rather than cook them whole. 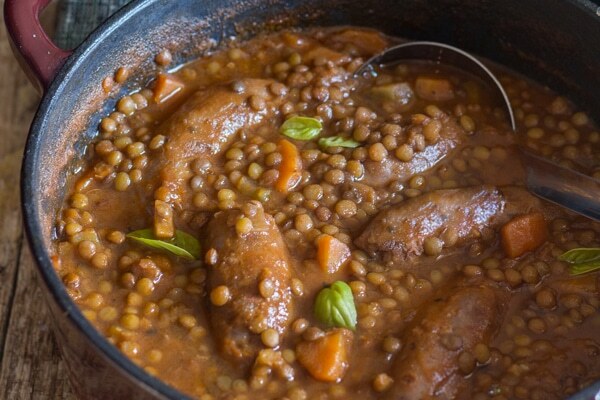 You can also pre-boil the Italian sausage for about 10 minutes to remove some of the extra fat and in my opinion the Lentils and Sausage Stew has a lighter taste because of that. Of course you don’t have to boil them if you don’t want, you decide. As with a lot of Italian soups and stews don’t forget to serve with a nice crusty Italian bread to soak up all the sauce and a nice white or red Italian wine doesn’t hurt either! So here’s to Italian comfort food. Buon Appetito and Happy New Year! 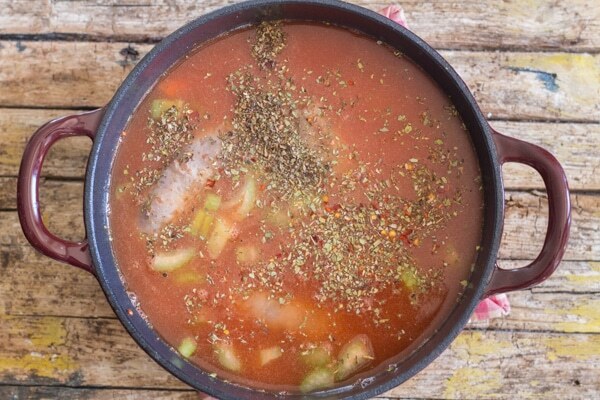 The perfect Healthy, Hearty Fall Stew / Soup. Full of Fresh Veggies, Italian Sausage, Lentils and Spices. In a medium bowl add lentils and cover with water, let sit for 30 minutes, drain and rinse with water. In a medium - large pot on medium low heat add the olive oil and the Italian sausages (prick the sausages with a fork), cook and brown on both sides, then stir in the chopped carrot, celery, onion and garlic, cook until onions are transparent (about 2 minutes) then add the lentils, stir to combine and cook for 1 minute, raise the heat to medium high and add the white wine continue to cook until wine has evaporated (about 2 minutes). Add the tomato puree, vegetable broth, and spices, stir to combine, cover and bring to a boil on medium high heat, then lower to medium low, leave half covered, stirring occasionally and cook for approximately 45 minutes, or until lentils are tender and liquid has thickened. If you prefer a thinner soup then you can add more broth or water. Enjoy! If you find the stew is too thick and the lentils are not cooked enough, then just add more broth. Be sure to stir quite often while cooking. Updated from September 28, 2016. Hi Karen, thanks so much glad you and your family enjoyed it. Have a wonderful Sunday. Do you use the green or orange lentils for this recipe? 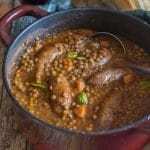 I’m thinking about substituting barley for lentils, what do you think? Hi Hollie, I think you could, I have never cooked with barley although I do like it a lot. If you try it let me know how it goes. Which brand of Italian sausage do you recommend for us in the US? Hi Cecille I really don’t know the brands in the US, but here is a link that might help. https://www.realsimple.com/food-recipes/shopping-storing/food/sausage-brands hope it helps. Happy New Year. HI Cecille, oh good and your welcome. My new favorite lentil recipe; it’s delicious! Hi Allie, thanks so much, so glad you like it! Have a great weekend. Hi Jill, thank you I hope you enjoy it! Just discover this post. I love the sausage and lentil soup at Carrabb’s Grill and always wish I would be able to get the recipe. Well, I thought this came extremely close. Hi Alma, so glad you like it. Have a great weekend. This looks delicious! 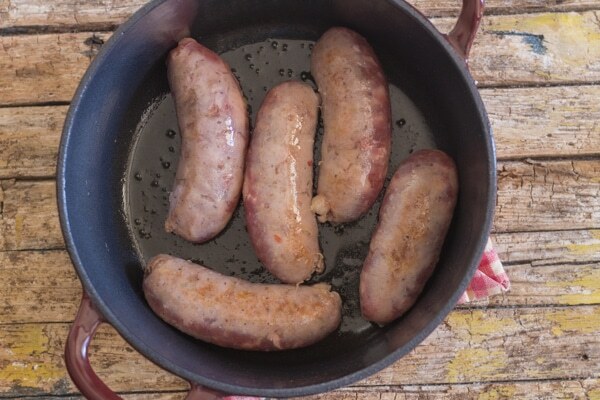 I’m a fan of sausage and the first time I used it in a soup, many years ago, I was hooked! I’ll be trying this…nice recipe! HI Annie, thanks a lot, I hope you like it, let me know! Hi Annie, exactly, my daughter to a T.
Hi Audrey, thank you. I Love sharing on Tasty Tuesdays. MMMM! This looks so good. I really need to cook with lentils more often. What a great soup recipe! It looks definitely hearty, comforting and of course delicious. I can see myself recreating the recipe tonight for dinner – good thing I have all the ingredients on hand! Hi Thalia, thanks a lot, let me know how you like it. Have a great day!